When you subtract the blue line under memo and the url of this page, the check looks real don't it? Make no mistake, even when you viewed this cheque up close it looked real. The kicker? It even was cashed and cleared by my bank. A couple weeks later the same funds disappeared out of my account. Although I never received a call from my bank or any notice about the check being cleared and then not being cleared, I knew before hand that the check was a scam. Afterall, I've been around the web for a while and am aware of the scams. 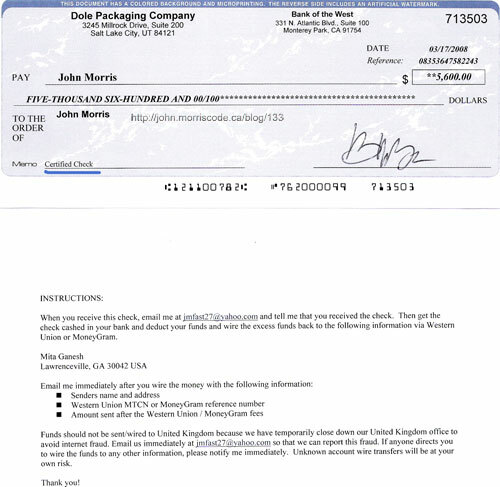 This particular one was sent to me almost a year ago however I thought I had lost the scanned image of the check, only for it to be recovered lately. While I was communicating with the scammer it was extremely obvious, to me, that he was trying to set me up. It musta been the fact he used 3-4 email addresses and did not want to communicate on facebook. Perhaps facebook was aware of this particular user and it was a matter of time before he was considered done. The fact he offered me $5,600 for a vehicle I was selling for $4500 was also a give away. He found out I was selling my Jeep Grand Cherokee through Facebook's marketplace.